Some deals are just OK, some are great, and some are no-brainers. If you’ve been pondering the purchase of a Sonos PLAYBAR TV Soundbar, then this Amazon deal falls squarely into that third category. There’s precious little question that the PLAYBAR is one of the best sound bars on the planet, and it’s worth every penny if you can afford it. But instead of spending $699 to buy it from Sonos, you can spend the same $699 on Amazon and get a $40 gift card back as well as 6 whole months of free unlimited music streaming courtesy of Amazon Music Unlimited. See? It’s a no-brainer. 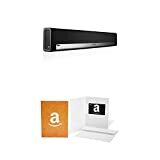 Get 6-months free towards Amazon Music Unlimited with purchase of Sonos PLAYBAR with $40 Amazon Gift Card.